In continuation to stepping towards digital platform transformations to the cloud, one of our clients recently started migrating the apps management from Microsoft Team Foundation Services (TFS) to the new Microsoft cloud tool called Visual Studio Team Services (VSTS). 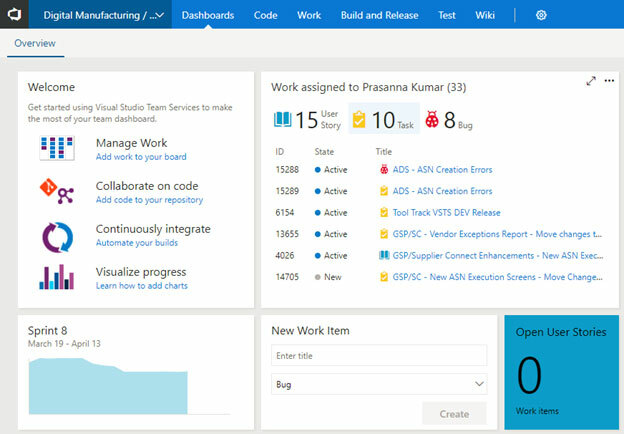 Visual Studio Team Services (VSTS) is an extension to the Visual Studio Online which allows you to manage work, collaborate on code, continuously integrate and visualize the progress of your application development. The main advantage of VSTS over TFS is unlike installing it as an on-premises software on a standalone machine we can access the tool from anywhere in the world connecting to the internet. In this blog, we will discuss only Work Item Tracking Service to demonstrate about how to keep track of all your project backlogs and its related work items in Sprint level and will discuss remaining services in later blogs. 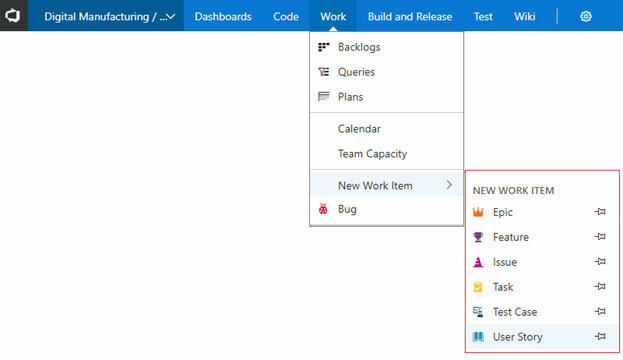 As an Agile team management tool, VSTS provides flexibility to keep track of project requirements, development efforts, test cases, bugs, release sprints, etc. Before moving on to the action, let brief about the agile framework terms – Scrum and Sprint. An agile framework to manage software development process to schedule and plan sprints, update tasks and monitor your sprint burndown. Also, called an iteration that bounds to a specified timeline typically – weekly, bi-weekly or a month which starts with sprint planning that targets to define a sprint backlog, identify the work for the sprint, and make an estimated forecast for the sprint goal. Before the sprint starts, the team will conduct a meeting for spring planning. During the sprint, plan team will identify and build product backlogs for the sprint. A backlog provides a repository of all the information we need to track and share with our team. Backlog contains a list of work items which we use to manage, organize, assign work to team members, share information with the team, etc. Planned Work Items: All the requirements which are planned for future development will be maintained in this category. Development Work Items: All the tasks which are approved and ready for development and in progress state are maintained in this category. Release Work Items: All the completed tasks which are passed UAT and ready to deploy to the Production will be maintained in this category. We can view the current sprint tasks in two ways in VSTS. List View: To view the existing product backlog items list, click on the Work tab and select the Backlogs menu item to navigate to the Work Items Backlogs. To create a New Work Item, click on the Work tab and select the New Work Item link and choose the type of work item from the sub-menu. For example, let us create a new User Story work item in the Development Product backlog area. Enter the input fields, Title, State (New, Active, Closed), Assigned To, Area, Iteration (sprint), Description, Planning section with Story Points, Priority and Risk, Development, Related Work section with new links to add corresponding work items as child item to this parent and click on Save & Close button. To add a related work item to the parent user story backlog item, click on the Add Link under the Related Work section and select New Item from the menu. The following pop-up will be shown to add new item related to the main user story. Enter the Title, State, Description, set the priority under the Planning section, and Effort (Hours) for the task under Original Estimate input field and click on Save & Close button. New user story will be created with the related tasks and can be visible in the Backlog list in the current sprint. Now, let us see how to log a work item type as Bug. The following pop- will be displayed with the required input fields which we need to enter related to the bug. Title: Name related to the bug. State: New (Default), Need to change the state to Active when work started and to Resolved once resolved and to Closed when testing confirmed by the tester/user. Reproduction steps: Need to specify the steps to reproduce the bug. Priority & Severity: Select priority order from 1 to 4 from the drop-down. Original Estimate: enter number of hours required for the work. Remaining: enter number of hours left to finish the task. Completed: enter number of hours of work finished. This is one of the coolest features in VSTS work items. We can choose the corresponding team member’s name from the Team to communicate information related to the bug or user story work items. After selecting and entering the message in discussion input box and when we click on Save & Close button the message will be sent to the team members specified in the message. In capacity planning, our team will estimate the efforts for the type of activity assigned to each team member. Click on the Capacity tab to view the current sprint team capacity. In capacity page, we can choose activity type for each member and specify the number of hours per day as capacity. For example, select the Activity type from the drop-down as shown below and set the number of hours per day. Capacity also considers for team holidays and leaves. We can specify the Days Off for each team member by selecting the duration between start and end days for the number of days off. In this blog, I have given a complete overview of one of the efficient Scrum/Agile services provided by VSTS. Hope we learned many features of Work Item Tracking service and I will continue with more in detail about the other services like Source and Version Control, Build and Release Management in VSTS.